There is currently just the 1 ferry route running between Poland and Bornholm operated by 2 ferry companies – Polferries & TT Line. The Swinoujscie to Ronne ferry crossing operates weekly with a scheduled sailing duration from about 5 hours. Whilst we’ve taken great care to ensure the information on this page is correct, as the frequency and duration of crossings on all routes can vary from time to time we’d advise that you get a live quote for current availability on this Poland Bornholm crossing between Swinoujscie and Ronne. Poland is a Central European country with a northern coastline approximately 440 kilometres long on the Baltic Sea, sharing its border with 7 different countries. Visitors come to Poland’s shores to discover its rich cultural heritage including the numerous museums telling stories of the nation’s dealings with World War II and the Soviet Union. Stunning historic sites and gorgeous landscapes come in abundance, too, most notably the medieval castles and red-brick fortresses dotted throughout the country. The capital, Warsaw offers a mix of both the historical and the modern, with plenty of upmarket restaurants, bars and contemporary architecture to be found alongside picturesque Gothic buildings. Poland has a few ports along its short coast offering frequent ferry routes across the Baltic Sea. The sailings are operated by a wide choice of ferry companies, which makes Poland a good departure point for Scandinavia. Bornholm is a Danish island in the heart of the Baltic Sea, west of the Ertholmene Islands, near the coasts of Sweden and Poland. The sunniest destination in Denmark is slow-paced, colourful and fertile, making it particularly popular with artists. And with almost 2,000 hours of sunshine per year, it’s a great island getaway, whatever the season. Bornholm is also unique, both in its culture and landscape. It’s the only place in the country where you can stroll along craggy coastlines with white beaches and it has a strong tradition of arts and crafts. 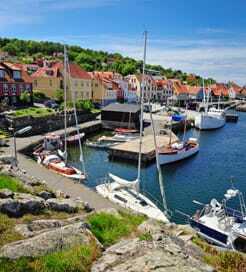 Given its central location in the Baltic Sea, Bornholm is easily accessible from a few countries by ferry. There are many routes to choose from, whether you’re sailing from the mainland, Germany or Sweden, which are all operated by one of the oldest ferry companies in Denmark.